Our logo came out wonderful. Thank you so much for the top tier customer support to guide to me to the exact product that I needed for my business idea. Custom Earth Promos really helped me narrow down my decision on the kind of bag that would best suit my business. I'm so happy with how the bags came out. The logo really stands out. These bags were a great fit for my business. Customized the eco-friendly bags just the way I had liked. Good quality bag made out of polyester. CEP delivers another spectacular bag that really helps promote my business. So many color selections for this eco-friendly bag. Thank you. Good quality, polyester wears well its a material that has stood the test of time. The print has lasted months on my personal bag I know it is on my customers. Very impressed with how great my order came out!! Thank you CEP! Great promotional item the Logo came out awesome on the bags! Love the color selection for these bags they all came out beautifully. Was really happy with the customer service Custom Earth Promos provided. They helped me design a beautiful logo and it printed wonderfully on this bag. I was really pleased with the way my logo looked on these bags once they arrived. Priced good for what it is, a very nice wholesale promotional bag. I ordered this bag for all of our summer school kids, it is a light easy to clean material. Cute and stylish bag, it fit our budget and we got them in time for our grand opening. These were super useful for carrying and storing. I love all the options, I ordered 5 different colors of this bag to add some variety to our order. They all came out the same print in the same spot looking good and pristine and the material is clean and sharp. I suggest this bag. Great little bag for the price. Red and Turquoise are the best colors to do a white and black print on, I learned this in a advertising class on how to catch the eye of prospective consumers. We did this for our bags and they came out looking very attractive. With a unique drawstring closure on bottom right-hand side of the bag, this folding tote bag can be quickly stored in its own compact pouch. Folding Tote Wholesale Bags feature a bold imprint area of 8.5" W x 7" H to showcase your logo or custom message. With a trendy and casual appeal, folding totes are a fashionable and cost-effective way to build your customer base through increased brand exposure. Invest in an eco-friendly image by increasing brand recognition through these fun alternatives to wasteful plastic bags. By promoting your business with reusable and recyclable, you establish a reliable and eco-responsible brand image that will foster brand loyalty and provide positive exposure. Use Folding Tote Wholesale Bags as complimentary gifts during industry trade shows, promotional events and as reward incentives to return customers, strengthening their personal and emotional connection to your brand. Work with our expert design team to customize your folding totes with imprints of your company name and logo. This helps you gain recognition when your customers carry these bags for their shopping trips and recreational activities. Add a thoughtful message, fun fact, or witty slogan to promote new products, services or to show your support for a specific cause. Establishing a company culture invested in the future of our planet is a stellar way to gain admiration from prospective and future customers. Announce your next product or service on a custom-designed eco-friendly folding tote to promote both your business and your brands' investment in environmental preservation. Your customers will know that you care for them and the environment when you provide them with the gift of this wonderfully convenient folding tote. Folding Tote Wholesale Bags from Custom Earth Promos are available in an impressive variety of ten color shades including black, white, red, blue, green, turquoise, purple, orange and pink. Choose a fabric color that best complements your company logo or mix up your order with two or more color options. With multiple customizations available, our tote bags are adaptable to promote a wide array of industries such as including hospitality, healthcare, retail, food and wine, and beauty. Work directly with our design experts to design eye-catching graphics that creatively represent your specific brand identity. Stay ahead of your competitors and stand out in your industry through the tactical utilization of these promotional bags. Make sure to provide your most loyal customers with a complementary folding tote to show your appreciation for their business. Gain brand exposure and awareness everywhere these customers happen to travel. 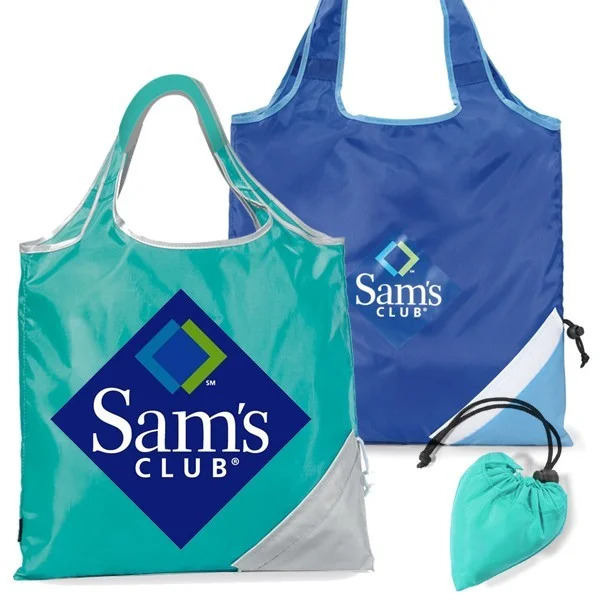 A great conversation starter, when brought to the gym, beach or grocery store, distributing your custom folding totes to VIP customers, will also increase word-of-mouth advertising. When you place an order with Custom Earth Promos, you're also safeguarding the health and safety of your customers. All our products have been tested and certified free of harmful pollutants listed under the California Proposition 65 guidelines. When you choose to order direct overseas with Custom Earth Promos, unlock a wide range of customization options and build your order of Folding Tote Wholesale from scratch. Add pockets or include an insulated lining in order to meet the needs of your target demographic. Increase the material density for increased durability or adjust the product dimensions for the perfect design to represent your business. We can even craft your bags in a custom fabric color that best complements your company logo or alternative custom graphic. Within 8-12 weeks, you'll have premium quality, fully customized promotional bags that accurately express the message of your brand. You dream up the design and we'll bring it to life!